We keep on testing portable devices for reading and recording flash memory cards. Today we have three drives: one has a pretty old interface but is still worth our attention, the second is a standard 6-in-1 card reader, and the third one supports all basic card types (only except such exotic one as Mini-SD). This USB 1.1 compact device supports MMC and SD cards. It doesn't boast of its speed parameters because of the old interface, but it's still able of 800-850 KB/s. It comes in a simple package with a CD with Windows 98 drivers and a USB extension cord which won't be that useful because the card reader itself is not big. I decided to test this USB 1.1 device because the questions like "is there anything small for SD?" come in pretty often, and since this is just the second such device (the first one was TwinMOS GoGo Egg, there's one more but I haven't got it) it's worth mentioning especially because there's nothing alike for the USB 2.0 interface. 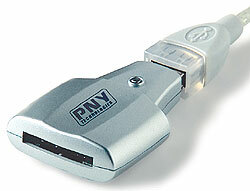 Some time ago the company had a multiformat USB 1.1 card reader and then released a more advanced model. It looks like the competitors: a small rectangular box with roundish corners. In contrast to most such devices, this one has card slots on its short sides; the USB mini-B connector is as usual behind. 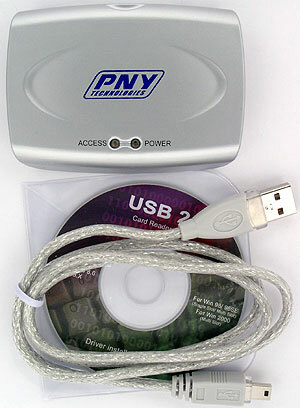 The detachable cable implies that the device is meant for desktop computers rather than for mobile use (in this case card readers usually have a short tail and a USB extension cord). There are two LEDs, one goes on when the device is connected to PC, and the other blinks during read/write operations. The disadvantage of this card reader is that it supports 6 formats instead of standard 7. Although I can't say that the Sony Memory Stick Pro is needed for most users today, other companies don't want extra money for its support. It's one of rare devices that supports xD-Picture. A similar card reader was already tested but Lexar had some problems with the memory size supported: it turned out that the firmware update couldn't solve the problems. There are three versions of this card reader, one doesn't need the firmware upgrade at all, another doesn't solve its problems with a new firmware version - anyway, xD cards over 128 MB are not supported. SanDisk's reader supports all sizes without any tricks. Its top panel looks standard: an ordinary box with a separable cable. In front you can see a combined xD-SMC slot, with its parts marked. There are 5 LEDs: one notifies about power supply, and the other are related with its slots. The LEDs go on when cards are inserted and blink when data are transferred. Such separate indication allows localizing problems at once, like incorrect insertion of a card (it's easy to insert SmartMedia cards the wrong way). The LEDs inconsiderably lift the overall price, but most manufacturers do not use them for some purpose, in spite of all their advantages (a similar solution was used only in DataFab ML4-USB2). Apart from a CD, a user manual and a PC cable (a short one), there's also a dock with a long USB cable. As a result, it's very convenient to use it indoors and outdoors. Besides, you have to to connect it to PC's back only once. Moreover, a short cable is rather a plus than minus for outdoor use. The device looks good on the desk and takes little space. But the standard mini-B connector is too deep inside - the respective connector of the dock and cable accounts for it but it won't let you connect standard USB cables (we came across such problem also when tested external hard drives, in particular, Fujitsu's one). Memory Stick Pro wasn't tested because one of the readers doesn't support it and I didn't have this card at hand. Moreover, the ordinary and Pro versions demonstrate very similar speeds in spite of the initial promise. By the spring Sony promises to lift the speed of its format up to the acceptable level by changing the interface, and as soon as they do it we will test them. Besides, we also tested the xD-Picture Fujifilm 256 MB card (from Toshiba), as this format is uniquely supported by one of the drives tested. The CF, MMC and SD demonstrate the access time within several milliseconds, while SM and MS show tens and hundreds of milliseconds for most card readers, that is why there are two diagrams. The "fast" group (all three USB 2.0 drives) shows the same access time exceeding the FireWire card reader. This difference is probably caused mostly by the interface. As to the other card readers, the FireWire is still ahead, with the others keeping very close to each other except the SmartMedia where the x-Drive performs a bit better than the new-comers. Now come more interesting and important parameters. As I mentioned, modern multiformat USB 2.0 drives don't read data from CF cards that well. In case of MMC and MS cards, the speed is limited by the cards themselves (however, the aged 6 in 1 IEEE1394 copes with these cards worse compared to the new USB 2.0 drives). As to the SmartMedia, PNY's drive shows the best scores, and in case of SD both tested drives show a pretty good speed, but they failed to catch up with the x-Drive. The reference FireWire drive scores the best results in case of SmartMedia. 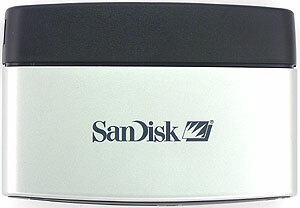 As to the SD, both new-comers come close to the x-Drive (especially SanDisk's drive), but none could beat it. Actually, there are few differences between modern multiformat USB 2.0 card readers: they cope with the CompactFlash equally bad, but they work well with SD. As to other card types, the cards' limitations have the greater effect, though the access time could have been lower. 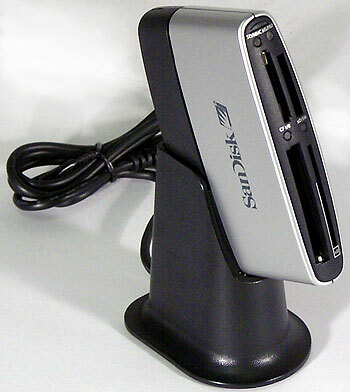 So, you can choose a card reader by its exterior or price rather than by other parameters. What else? They support the extended MMC version at higher speeds. On the other hand, such cards have a lot of compatibility problems, and it's possible that SD will press them out of the market soon. The xD-Picture support can be important for many out there. One of the drives does have it, so let's have a closer look at it. There are no candidates to compare with the ImageMate, that us why we will use Lexar's drive for comparison. Although the latter was tested with a 128MB card instead of the 256MB one, I think we can neglect this difference. The cards are produced by the same company at the same time, and they contain nothing except the flash memory, that is why their performance must be equal. We'll also add the scores of SmartMedia, thankfully the xD is going to replace exactly this card format. Lexar has the equal access time for both card types, while SanDisk performs twice worse on the xD. It could be caused by the twice greater size, but SmartMedia cards of different size have equal performance. Let's put off this problem until we get more data. Just note that xD performs not better than SMC, at least. Lexar reads data better, but in both cases SmartMedia looks better than xD. 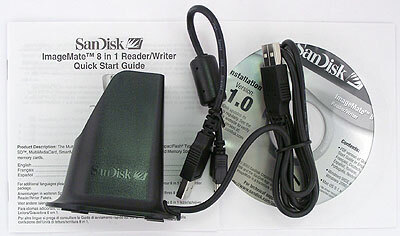 When choosing a card reader for xD-Picture cards pay attention to its support rather than its quality of realization. When choosing between xD and SMC you'd better take the latter if you don't need cards over 128MB (per one card; as to the summary size, several SM128 cards will be a better choice judging by the price), since the new cards have no weighty advantages over the old ones. I wish they lift the SmartMedia size up to 256MB at least, rather than bringing new formats. But the manufacturers want money rather than user satisfaction, that is why the choice between two formats is rather hypothetic than real. Well, none of the devices beats the records. Only the SanDisk ImageMate looks outstanding thanks to its support for all modern formats. On the other hand, the xD-Picture support is needed only for those who have such cards - its maximum functionality is just a temporary advantage because Mini-SD and faster Memory Stick are expected soon. Those who need the xD today don't have a wide choice. 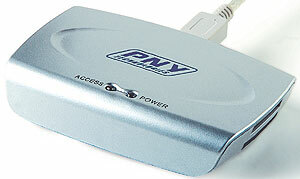 PNY's multiformat drive demonstrates an average performance, like most other drives. The miniature one-format drive from the same company does have a certain niche on the market, but the company would better equip it with the USB 2.0 interface so that the flash drives and portable card readers could compete again, like a year and a half ago.